As I had promised you earlier in my first post about Minimalist Lifestyle, I will be sharing small steps which are helping me living minimally. One cannot empty the spaces they live in, overnight. How much the World is talking about it but let’s be practical here. Being a Family with Kids means more stuff which further means more time it will take to de-clutter. I started with removing the distractions and non-important things so I can focus my attention on the things that truly matter. Ultimately, Minimalism is designed to reduce the stress and make our lives better. Isnt’t it? Going by the above powerful quote, I followed the Subtraction and Addition principle in January and it really worked. Living minimally starts by removing or cleaning the clutter. Keep negative vibes at bay by throwing out those items you no longer need or use. A non-working clock, broken mirrors, cardboard cartoons, non-usable paper. Sell them, shred them or throw them out. The must-do morning ritual of mine is to clean and make the bed once I jump out of it. It leads to a more productive day overall. Plus, when you return home in the evening, you’ll be greeted by a tidier, calmer bedroom. But my husband did not like it as I used to ask him to get up early (if you are raising your eyebrows, let me tell you early here means 9 am) so that I can do the same before leaving for the Office. We made a DEAL. He can get up whenever he wants but then he would follow the ritual. Wink Wink. Second accomplishment was when I stopped myself spending on a Nail-paint which wasn’t really required but was tempting enough to resist. Somehow, I managed to win over my hunger. Not only our Homes but our Cars need it too– One Sunday, I went down to spring clean my Husband’s Car as every time I used to open its dashboard, I had to close it with unhappy expression. I was surprised to even find the stuff which was kept 2 years ago. Husband was not so happy with it but it gave me some peace. Living minimally also means adding meaningful insights to Life- things or experiences. I came across multiple articles which mentions the significance of Swastik and Ganesha together. Its a symbol of positivity. Rather than buying it, I decided to create it at Home using already bought material – I will write a separate post on How to DIY. January ended with satisfactory results. Lets see how it rolls out for rest of the Year to come. Are you a minimalist? Do you like the idea of living minimally? If Yes, How are you putting it into practice? Before ending the post, I must recommend you to checkout this- “A month of minimalism” by The Minimalists. Does your Job matches your lifestyle expectation? Hey Lucy, I am sorry for my late reply. This quote has moved me too. I am too a beginner in this journey. 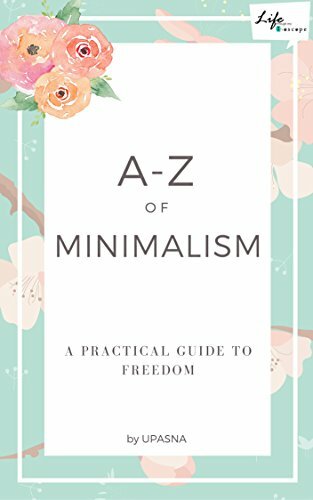 DO join me in April as I will be sharing A-Z of How to begin this journey of Minimalism.